Activists are angry about a decision by China to screen candidates for Hong Kong’s 2017 leadership election. They want direct talks with Beijing. Government supporters also took to the streets and confronted the protesters outside the representative’s office. 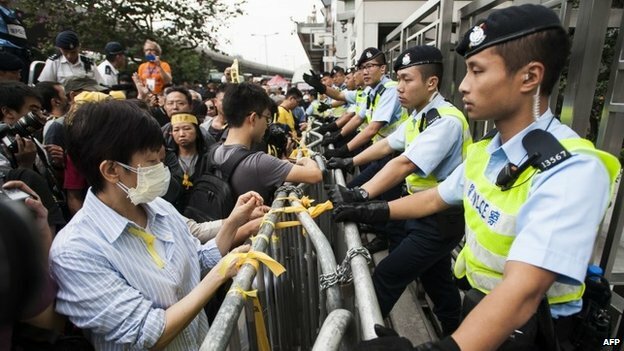 Activists tied yellow ribbons, a symbol of their demand for more democracy, on the gates of the China liaison office. The march on Sunday follows almost six weeks of sit-ins and road blockades in a number of central districts. 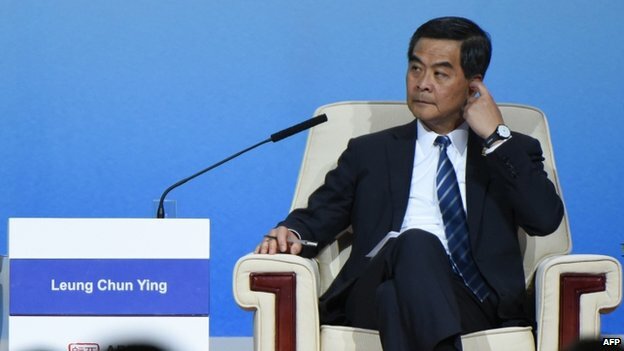 Hong Kong Chief executive CY Leung – who is in Beijing – received the full support of President Xi Jinping in his dealings with the protesters. Mr Xi said that he firmly supported Hong Kong in “driving forward the development of democracy according to the law, and in safeguarding the prosperity and stability of Hong Kong”. 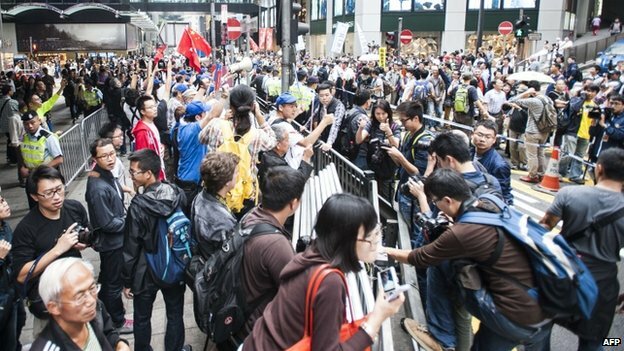 The BBC’s John Sudworth in Hong Kong says that there is no sign that the Hong Kong government is prepared to make any concessions. Protesters say that attempts to negotiate with the Hong Kong government have failed and now appear to be directing their grievances towards China’s national leaders, our correspondent says. China now has ultimate sovereignty over Hong Kong following the handover from Britain in 1997, although the territory still enjoys a large degree of autonomy. The protesters began blocking a number of key areas of the city six weeks ago after they accused Beijing of breaking a promise of greater democracy. The ruling communist party’s new rules for the election of Hong Kong’s chief executive allow it to veto candidates it deems unsuitable. This entry was posted in Era of Peaceful Resistance and tagged Beijing, CY Leung, March by oclphkenglish. Bookmark the permalink.